Mira has officially been one for 10 days now, yet we feel she acts like a two year old already. She's starting to throw tantrums when she either doesn't get her way or gets something taken away, or simply just when she doesn't know what she wants. On the bright side, she's becoming so much fun to play with. We're playing more games with her, singing more songs, reading more books, dancing together, having "conversations" with her, playing "her way" and letting her run into my bathroom and grab all my nail polishes, one by one, and bring them into another room to hand them to daddy. She really thinks she's doing something important with that one and it's too funny. 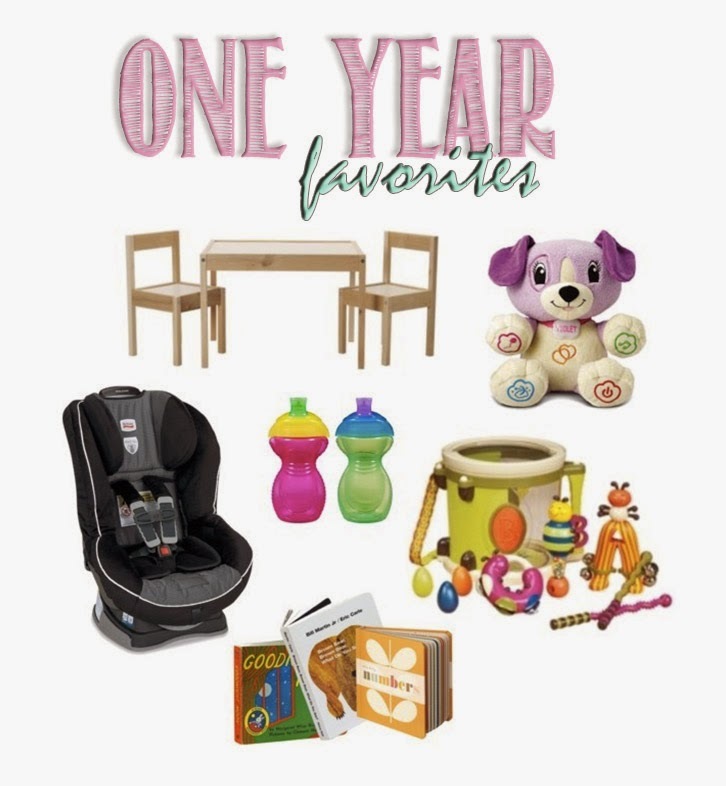 Since Mira just had a birthday party and got lots of fun presents, we have a new list of "One Year Favorites". Ikea Play Table. I pinned this on Pinterest a couple months back, but never ordered it. Then one day when I got home from work a huge package was sitting in the entry way from "Ikea". All I could think was that I possibly had shopping amnesia and thought I had ordered it and didn't remember. But I found out that my mom ordered it as a gift for Mira and just got here a couple days after her party. What a fun surprise! Adam got it put together in minutes and Mira loves it. Violet the LeapFrog Puppy Pal (Target). This was a birthday gift as well. Mira just loves it. You hook it up to your computer and choose which songs you want it to sing and then tell it your kid's name, favorite animal, favorite food, favorite nursery rhymes, lullabies, etc. Britax Boulevard Convertible Car Seat. Britax products are thee best in terms of everything; safety, installation and use, quality, and sleek looks. This was a gift from grandparents, but Adam and I both have one in our cars. It's easy to put Mira in and take her out, it's seemingly comfy, and I see it over and over again on various car seat reviews with 5 stars and best baby products lists. Munchkin sippy cups (Target). Once Mira turned one, I told daycare to switch her over to only sippy cups. She has several different brands and styles of sippy cups, but I like these ones the best, mainly because they're the most leak-proof. Since I'm still pumping at work, I usually give her a sippy cup with breastmilk in it with her dinner. B. Parum Pum Pum Drum . This was part of our gift to Mira. She loves banging on things so I knew this would be perfect. She just loves this thing. I keep joking to Adam that she's going to be the next Justin Bieber.